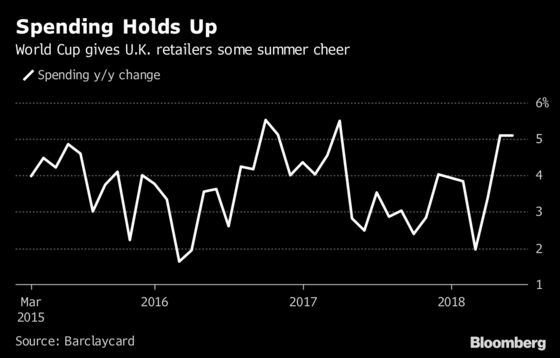 (Bloomberg) -- Excitement about the World Cup is boosting U.K. consumer spending on entertainment, barbecues and televisions. Consumer spending grew 5.1 percent year-on-year in June, Barclaycard said on Tuesday. A separate report from the British Retail Consortium showed that like-for-like sales gained an annual 1.1 percent. The English team are enjoying their best tournament for decades and are due to play Croatia on Wednesday in the semi-finals of the soccer tournament, the first time they have reached that stage since 1990. Entertainment spending surged the most since July last year, according to Barclaycard. 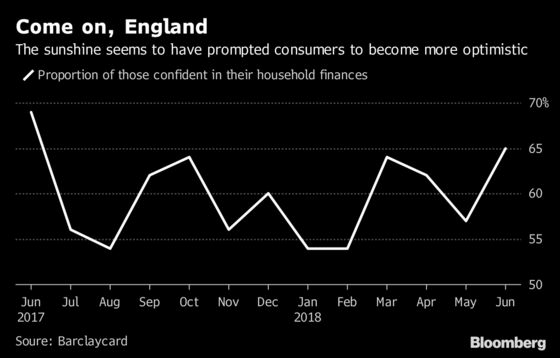 The sunshine also boosted consumer optimism: 65 percent reported confidence in their household finances, a 12-month high. “As the warm weather continues and World Cup fever sets in, it’s clear many households are prioritizing fun in the sun while making the most of the summer’s best experiences,” said Esme Harwood, director at Barclaycard. In particular, soccer fans boosted sales of beers, barbecues and big TVs, according to findings in the British Retail Consortium-KPMG retail sales monitor. But BRC chief executive Helen Dickinson warned that England’s success would not suffice to support the struggling retail sector. Marks & Spencer Group Plc announced in May that it plans to close about a third of its large U.K. stores over the next four years, and baby-goods chain Mothercare plans to close 60 stores across Britain.